Contest will not run during weekends (7, 8, 14, 15, 21, 22, 28 Feb 2015 and 1 March 2015) and the Chinese New Year Public Holiday (19 and 20 Feb 2015). User is presented with one visual of a Toshiba product each day. Between 10am and 9.59am the next day, user will attempt to identify the product in the visual. User can change their answers multiple times before the next visual is up. Each visual will contain 5 levels of filter - from Blur to Clear. Every successful referral removes 1 level of filter till the image becomes clear. A button named "Rally for Help!" will be presented beside the visual and on the Acknowledgement page after the question has been answered. Clicking on "Rally for Help!" brings up a light box with "Share" and "Invite" buttons and text links that can be shared. Before the user submits his/her answer, the user has to complete a short survey. User will only need to complete the survey once. 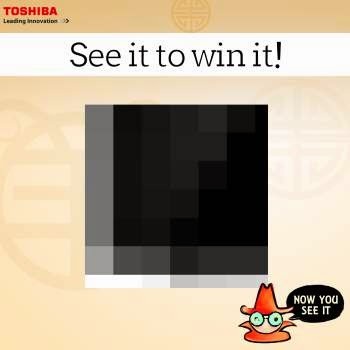 Visit Toshiba "Now You See It" contest page for more details.